In anticipation of the 2018 FIFA World Cup, Russia has commissioned architecture firm Populous to design the new Rostov Stadium. Inspired by ancient Kurgan burial mounds, the stadium swirls up from the ground, harmonizing with the surrounding landscape. 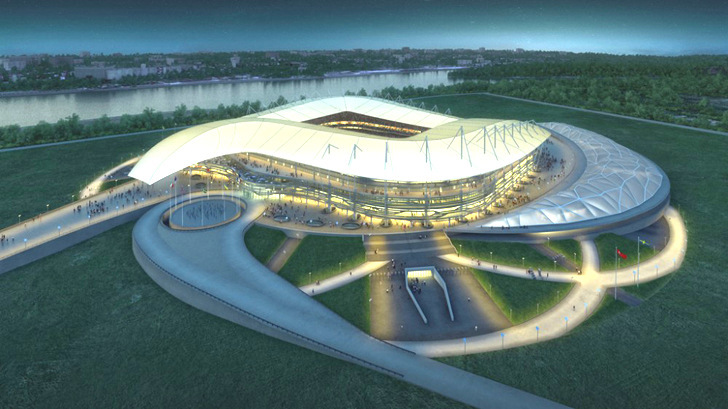 The new Rostov Stadium will join the three other sustainable stadiums designed by Populous in Russia. For the 2018 World Cup games, the sprawling stadium will hold 45,000 seats for soccer fans. After the games are over, the 20,000 will be removed for regular games and events, giving more space to patrons. Rostov Stadium is part of a sustainable green city project for Rostov-on-Don, which will center around the stadium and the area wetlands. Along with other developments, the stadium will help protect the wetlands from over development. The stadium will be surrounded by a white shade that wraps around the circumference, allowing natural light to filter in, as well as natural air circulation- while also safe guarding fans from rain or wind. It will also shade several levels of shops on the exterior, which are open air and welcome guests at the entrance of the building. 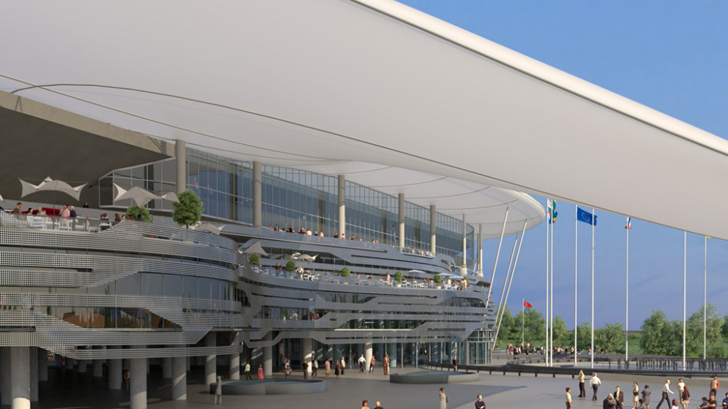 The construction of the Rostov Stadium will be a catalyst for the region, activating the river’s water front and transforming it into a mixed-use cultural center. The sixty-four world cup games will be divided up between twelve venues, including Moscow, Saint Petersburg, Kaliningrad, Nizhny Novgorod, Kazan, Samara, Saransk, Volgograd, Rostov-on-Don and Yekaterinburg.